We Can Build a Custom Seawall Solution For Any Property on Lake Norman, Mountain Island Lake, Lake Hickory, Lake Wylie, Lake Rhoadhiss, High Rock Lake or Lake James! If you live in Lake Norman or its surrounding areas, you are likely able to take advantage of the beautiful views and scenery associated with the nearby ocean. Although the ocean can be beautiful, it can also be harmful to residents trying to construct homes and businesses near large areas of water. Seawalls are designed and constructed to protect buildings and land from the effects of flooding and erosion. At Renegar Construction, we are able to build highly functional and efficient seawalls that will protect your property from potential flooding and the effects of erosion. 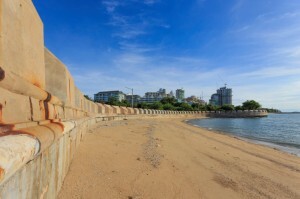 The way a seawall is constructed is dependent on the specific location and the materials used to build it. Since there is no specific way to build an effective seawall, Renegar Construction will consult with you to determine the needs you have for your new seawall and your preferred area of coverage. Since seawalls are constantly exposed to water, they eventually need to be repaired or reconstructed. To save you from the expenses associated with repairing or building a new seawall, we will build your seawall correctly the first time! At Renegar Construction, we are known for the high-quality seawalls & shorelines we build and our dedication to our customers. If you are looking for a reliable yet affordable solution to protecting your North or South Carolina property from water, having a seawall constructed by Renegar Construction will work out in your favor. Our company is reliable, dependable, and honest. We will always be upfront with our costs and will never force you to pay hidden fees.